$350 includes the gold wood frame, ready to hang. 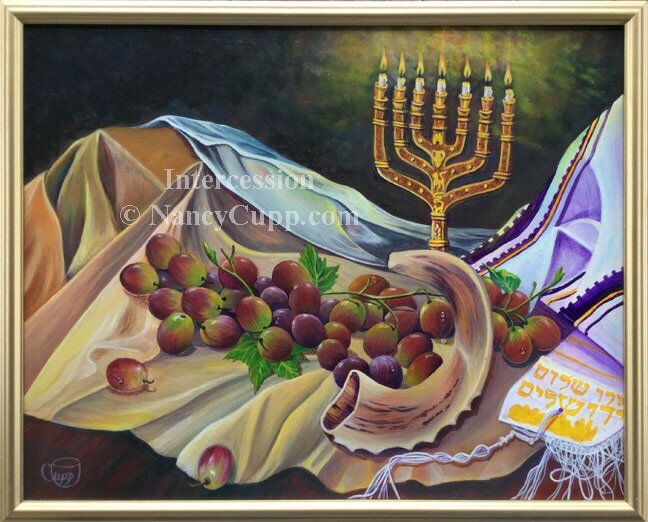 This is my first painting using Judaic objects for a still life. 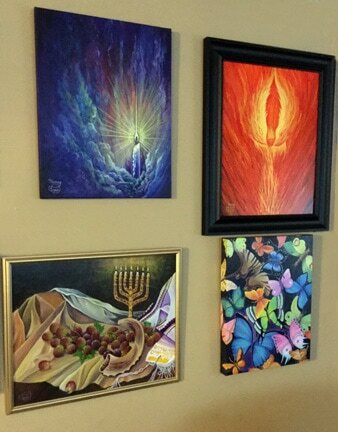 I chose the menorah, a shofar, and a prayer shawl. Each have great spiritual significance. The prayer shawl has fringe along the edge that represent the 613 laws of the Torah (the first five books of the Tanak known as the Old Testament). Do you remember the story of the woman with the issue of blood who grabbed the hem of Jesus’ garment? Luke 8:43-48 All Jewish men wore tassels or tzitzit on the four corners of their garment, which was to remind them of the word and laws of God. These tzitzit are what the woman was really reaching for. She knew that if she could grab the tzitzit, she would be healed. These tzitzit were tied into the cloth corners called the wings. You can see the wings in the lower right corner of the painting. Both the tzitzit and wings represented healing. The menorah was used in the temple to represent the light of God. The shofar is the ram’s horn used to call people to prayer, sound an alarm, announcements, etc. God is calling His people to pray as never before to usher in His kingdom. The grapes make wine, which represents the Holy Spirit. The Holy Spirit is our intercessor, teacher, comforter, power of God, and that which gives us life. When The Lord created Adam, he breathed his own Spirit into Adam which brought the “clay” to life. Mankind is the only living being that was given the privilege of being made in God’s image, or His Spirit. This painting is called intercession, symbolic of praying and standing in the gap for others. Prayer can be very powerful and rescue people from danger. We are called to pray for one another. Jesus is our perfect Intercessor.